It is no secret now that I am a huge fan of Lush products, and they are my number one brand when it comes to treating myself to a good bath. 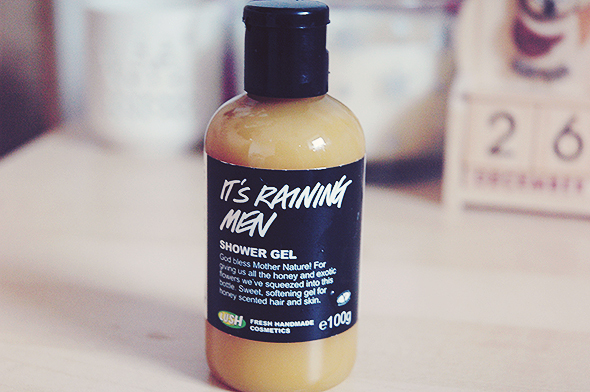 It's Raining Men is one of their best selling products, and is scented with the same fragrance as the Honey I Washed The Kids soap, which I absolutely adore. It has such a rich honey-toffee scent to it, so if you have a sweet tooth like myself you are bound to love it. You only need a small amount for it to lather up nicely, leaving your skin feeling soft and nourished. Best of all, the scent lingers on your skin! The consistency of the gel is quite thick making it slightly more difficult to get out of the bottle, but I much prefer this to runny, watery shower products that just end up running straight off down the plug, gone forever. I don't have much more to say about this other than it is an absolutely gorgeous product. It doesn't come all that cheap, but as I mentioned previously you do only need a small amount to do the job. If you're a Lush virgin, I would strongly suggest having a sniff of this in store - this is the scent that got me hooked! Have you tried It's Raining Men? Do you love it as much as I do? I love Lush too, their face powder is amazing!! I've not tried their cosmetics yet, will have to have a browse next time I'm in store! It really is, smells good enough to eat! I love Honey I Washed The Kids too, will dfinitely have to try this someday! I know what you mean with runny shower gels - what a pain in the a**!